This small-group tour gives you the opportunity to visit Thomas Hardy's birthplace, the evocative cob and thatch cottage, and visitor center. Experience Max Gate of Dorchester, a house he built for himself and his first wife, Emma Lavinia Gifford, also where he died in 1928. Far from the Madding Crowd, Tess of the d'Urbervilles - If you've heard of these titles, you'll know this truly a literary tour. If you are a Hardy fan, then this is one tour you don't want to miss. The tour can last up to 5-6 hours depending on time of the year, traffic, and how much you want to get to know the man behind the true literary greats. Leaving from Dorset you visit Portland (Isle of Slingers). The Isle of Portland, joined to the mainland by the narrow strand of Chesil Beach, is the setting for The Well-Beloved written by Hardy and published in 1897. Pass through Weymouth or Budmouth Regis as Hardy called it. Hardy worked as an architect here between 1869-1870, and the town features in Under the Greenwood Tree. Move on to Dorchester or Casterbridge as Hardy refered to it. 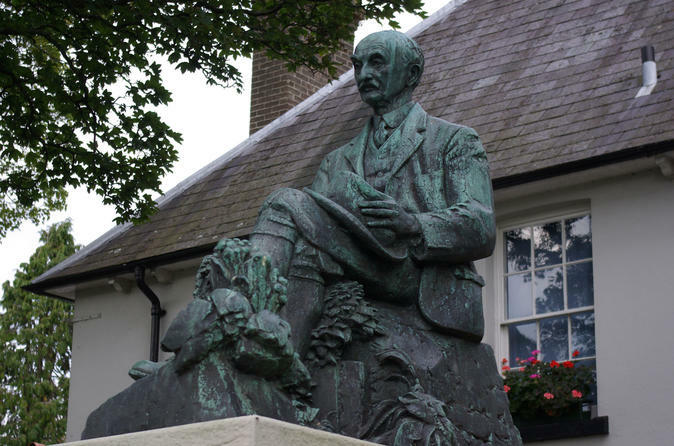 You visit the Thomas Hardy Statue, his house Max Gate, designed by Hardy in 1885 and a walk around the market town of Dorchester. On to the evocative cob and thatch cottage - birthplace of Thomas Hardy. Here you will spend time using the visitor centre near Hardy's Cottage in the heart of Hardy Country. Take a look at where Hardy - or a part of him - was laid to rest. The true Hardy fans will understand that last reference.